Associate Justice Franklin D. Elia received his undergraduate degree in 1972 from Santa Clara University and his law degree in 1975 from Santa Clara University Law School. He was admitted to the California Bar in December 1975. From 1975 to 1980 Justice Elia was a Deputy Attorney General in Sacramento and San Francisco at the Office of the California Attorney General. There he represented the People of the State of California in criminal prosecutions and appeals in addition to representing the Attorney General in prosecutions and civil trials involving patient abuse in nursing home facilities and revocation of licenses of such facilities in Northern California. He also served as a deputy district attorney in the Sacramento District Attorney’s Office while on special assignment from the Office of the Attorney General. From 1980 to 1983 he was Senior Assistant City Attorney for the City of Palo Alto, where he represented the City of Palo Alto and its various departments in civil litigation. The Mayor and City Council of the City of Palo Alto passed a resolution of commendation for his service in defending the City with distinction in the trial courts and for outstanding public service to the community. In 1983 Governor Deukmejian appointed him to the position of Santa Clara County Municipal Court Judge; he was 33 years old. There he served in the court’s civil division and as Supervising Judge of the criminal division. He received an award for outstanding service as a municipal court judge by the judges and commissioners of the Santa Clara County Judicial District. In 1986 he was elevated to the Santa Clara County Superior Court, where he served in the criminal, family law, juvenile, and civil divisions. He was recognized for outstanding service as a juvenile court judge by the Santa Clara County Juvenile Justice Commission and for his “dedicated leadership and pursuit of excellence in family court” by the Family Law Section of the Santa Clara County Bar Association. In September 1988 Justice Elia was appointed by Governor George Deukmejian to a newly created position on the Court of Appeal, Sixth Appellate District; he was 38 years of age. The voters of the State of California elected him to a full 12­-year term in 1990 and 2002, and then again in 2014. To date he has been a member of the judiciary for 32 years, 27 of them as one of two most senior justices of the Sixth District Court of Appeal. 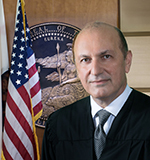 Justice Elia has authored thousands of appellate opinions in every area of the law and was voted Justice of the Year for judicial excellence by the Santa Clara County Trial Lawyers Association in 2015. Justice Elia has also served by designation of former Chief Justice Ronald George and current Chief Justice Tani Cantil­-Sakauye as an Associate Justice Pro Tem on the California Supreme Court. Before assuming judicial office, Justice Elia was actively involved in the Santa Clara County Bar Association and served as chief counsel to the State Bar of California’s Committee on Moral Character. Since assuming judicial office he has served on the Judicial Council’s Appellate Indigent Defense Oversight Committee and the Standing Subcommittee on Appellate Courts. He has also been an adjunct professor of law at Santa Clara University Law School and a member of the law school’s Appellate Advisory Committee. He has been active in the Trial Advocacy Program at Stanford Law School and the University of San Francisco School of Law. His involvement in legal education has also included the Traynor Moot Court Competition at the University of California Berkeley and Hastings College of the Law. Justice Elia has frequently visited high schools in the community to talk about the judicial system and its importance in our society. He has also helped young law students prepare for the practice of law through externship opportunities in his chambers at the Court of Appeal.